Although we're a "Bed & Breakfast", we cater very much to the business traveler looking to avoid a stay in yet another impersonal hotel. 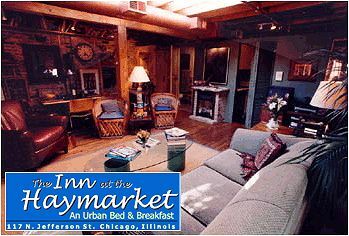 Located within downtown Chicago's Loop, our accommodations are unique in that our two main suites are located on the rooftop of a 100 year-old building, surrounded by an urban garden, featuring a covered deck and various art and decorations from around the world. Choose from a one-bedroom apartment or a select guest suite overlooking the rooftop garden.